China’s warning to Pakistan: Are we willing to do the needful? China is in many ways an ally that is the complete opposite of America. One way that has had great consequences for our relationship has been America’s insistence on doing business in the public spotlight whereas China has always been willing to speak about sensitive matters behind closed doors. Even though Chinese officials don’t give public statements the way Americans, do, it is still possible to understand how relations between our two countries are going if you’re willing to pay attention. Today, China sent us a very clear message: And it’s not good. China’s decision to cancel a visit to Islamabad while keeping plans to visit India is a clear and strong message from our ‘all weather friend’. China is not happy with what is going on in Pakistan, and they clearly feel like we have not been listening during closed door conversations. This is why they felt the need to make a more public statement. For months, China has been turning up the heat on both civilian and military leaders in Pakistan, asking hard questions and requesting to see real progress against the growing problems of extremism and militancy. Army responded by launching Zarb-e-Azb operation, and China applauded the move. That praise has soured, however, as reports began to surface revealing that the operation was more about public relations than getting rid of extremism. The reality of the situation was made all to clear when jihadi terrorists killed over 100 Chinese in an attack over one month after Zarb-e-Azb had begun. Historically, China has sympathised with Pakistan’s claim on Kashmir, but as jihadis use the region to enter China, that may be changing. Already China is stepping up patrols along Khunjerab Pass, and it is almost certain that discussions with India will include the issue. The fact that the Chinese have canceled a trip to Islamabad tells that they no longer trust Army’s promises until some actual proof of a change in direction is given. This likely means a public act against not only foreign militants in Waziristan, but Pakistani militants in Kashmir. 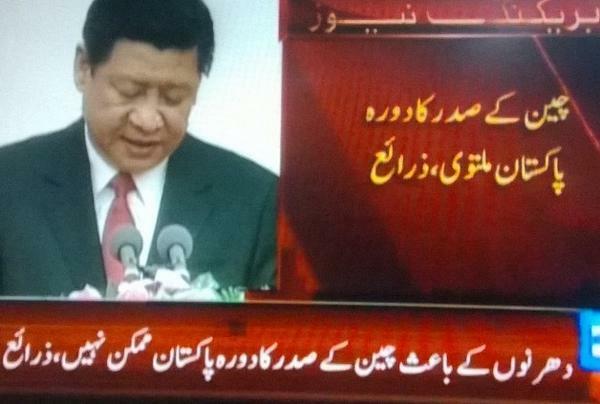 America may have permitted Pakistan Army to run with hares and hunt with the hounds, but China has no such intentions. The choice we are facing could not be more serious. If we do not address the problems of extremism and militancy, we will lose China as an ally for the foreseeable future. If we continue to allow extremism and militancy spread, we will push China squarely into the arms of India. And then where will we be? The choice is ours. The question is are we willing to do the needful. This entry was posted in Blogs and tagged China, extremism, india, kashmir, militancy, Xinjiang by Shaista Sindhu. Bookmark the permalink.